About Ben and Mayra Stern – Stern Realty Co.
Our July 25, 2018 Toscana Real Estate Newsletter is ready to view here! It includes: information about the current real estate market in Toscana, such as Toscana condos for sale, condos sold, condos under contract, Toscana condos for rent, condos rented, statistics, Highland Beach real estate market information, real estate articles, and more! What do Toscana residents think about our Toscana Real Estate Newsletter? 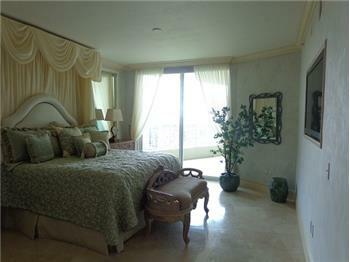 Best deal in Toscana for a furnished seasonal rental with stunning ocean & Intracoastal views! Modern/elegant furniture. 2 huge balconies! 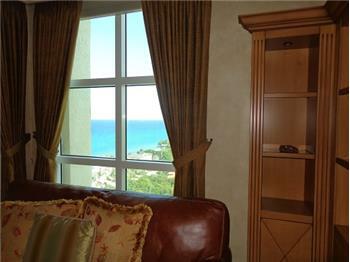 East balcony has ocean & Toscana grounds views. 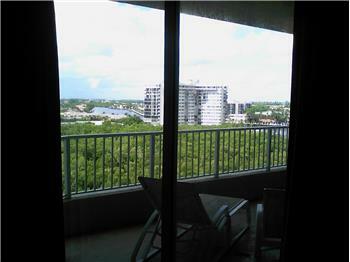 West balcony has long Intracoastal views. 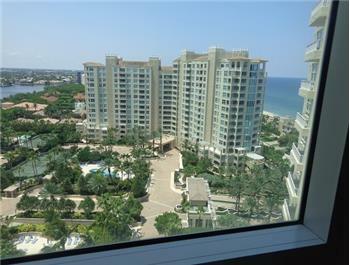 This condo has 2 bedrooms, 2.1 baths, and over 2,369 sq. ft. of living area. Bright open floor plan, Saturnia marble floors everywhere! Impact glass windows, custom built-ins, granite counters in the kitchen, custom entertainment center, surround sound, & custom soundproof wall unit. 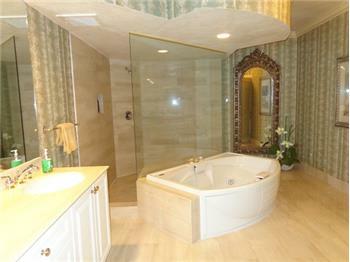 Master suite has closet built-ins, marble master bath w/hot tub, dual sinks, & separate shower. Guest suite w/private bath. Large laundry room. Private elevator entry to each unit. Unit was recently painted. 24-hour manned gated, luxury oceanfront community, with 2 tennis courts, bocce ball court, shuffleboard, and a private beach with beach club. Each Toscana building has a heated pool and hot tub with attendant, cabana baths, fitness center, sauna, steam room, locker room, billiard’s room, social room, TV room, business center, kitchen, private coded elevator access to each apartment, underground parking, valet parking, 24-hour concierge service & staff, bicycle storage, and on-site maintenance & management. Come see what the Toscana Lifestyle is all about! 5 min. away from trendy Delray Beach and famous Boca Raton. 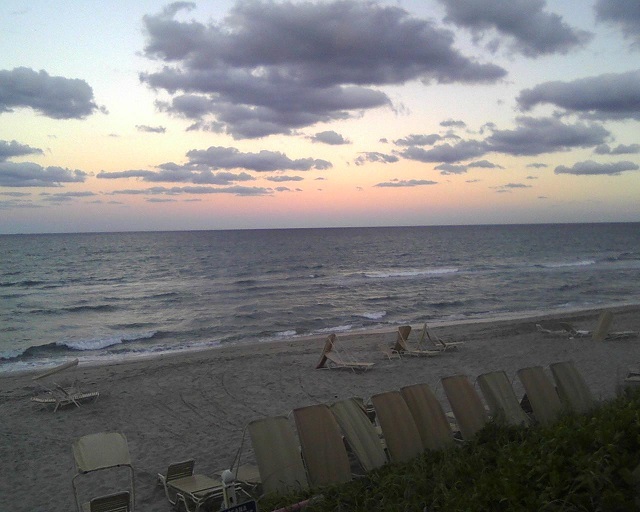 Highland Beach is a small exclusive beach town located just south of the City of Delray Beach and north of Boca Raton in Florida. The Town is 1.1 total square miles. This condo is available December 2018 – April 2019. 3 months minimum. $9,500 per month. No pets allowed for renters. MLS#: RX-10450366. For more information, contact Ben & Mayra Stern, Realtors with Stern Realty and Toscana residents, at 561-715-0314 or by email at BenAndMayraStern@Hotmail.com. If you want to get our Toscana Real Estate News monthly by email, or if you want to sign up to get automatic alerts when there is a new listing for sale, for rent, under contract, or sold here in Toscana, please email us at: BenAndMayraStern@hotmail.com . > Please, add our email address to your email contact’s list so our Toscana Real Estate Newsletter does not end up in your Spam or Junk Folders. Also, check your Spam/Junk Folder filters to make sure you can get emails from us. Add our email address there too as safe senders/safe mailing list! Stern Realty Reviews: Ben & Mayra Stern, take pride in giving excellent service! Thinking about using our services? There are many things we can say about the high quality of service we provide to our home seller and home buyer clients, but probably none would be as credible as testimonials from some of our clients themselves. So please take a moment to read the following testimonials from past clients. We hope they indicate our experience and integrity, as well as make it clear how much we enjoy helping people with their real estate needs. Stern Realty in Highland Beach, FL Reviews: over 25 years of excellent service! 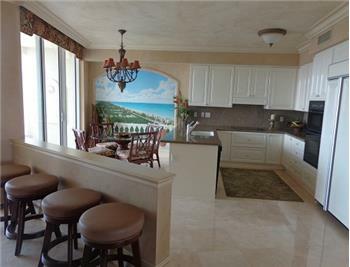 · They personally showed the condo (and sold the Toscana Lifestyle) 13 times. They accommodated the showings, even the ones that were short notice, 7 days a week. · They did tons of online marketing, mail outs, and a Broker’s Open. · The property was on the market 113 days (a little over 3 months). · They provided me information about other condos for sale, under contract, and sold, that helped with my decision making about the price. · Compared to the commission many other real estate agents charge, they saved me about $13,000 (5% vs. 6%, on a $1,300,000 sale). · They notified me of each showing appointment and gave me feedback each time. · They gave me regular updates. · They helped all parties obtain any information they needed, assisted with the appraisal & inspections, scheduling and meeting the charity organization that came to pick up the furniture, meeting with repairmen to fix the sliding glass door locks, & much more. “Almost 2 years ago, we were recommended by an employee to use an agent who was supposedly the best in Toscana. One and half years later, with our place sitting vacant, hardly any showings, and no offers, we decided to hire Ben & Mayra Stern, who live right here in Toscana. In only a few short months, they showed our place 17 times during the slow Toscana off season, brought us 4 offers in writing, and were able to get us a full price offer. They helped us with everything, including the inspection, cleaning and emptying our home, the walk through, and the closing, all without us ever needing to go back to Florida. Their service is unbelievable and they saved us over $10,000 in commissions. We could not have sold our place without them. Thank you so much, Ben & Mayra! I want to express our appreciation for everything you have done for us”. I could not have found better agents to handle the sale of my condo apartment. I greatly appreciate your concern, guidance and thoroughness. Your help in every respect was above and beyond my expectations. Not only was your performance most efficient, but you made every effort to conclude the transaction to the satisfaction of all involved. It is without hesitation and with pleasure that I will recommend your services to others. Again, many thanks. It was marvelous dealing with you. Ha sido un placer trabajar con ustedes los últimos dos años en los que pudimos rentar nuestro apartamento a un precio razonable y ha personas muy agradables. Ustedes son personas muy profesionales y diligentes en su trabajo y es por eso la efectividad en los negocios. Esperamos poder seguir haciendo negocios con ustedes y con las personas que recomiendan como clientes. Natasha Maldonado, former Motorola Human Resources employee. “…Mayra & Ben did a great job of keeping me informed. Everything went very smoothly and I am sure it was due to a large part of how thorough and dedicated they both are”. “We have sold many homes in the past, and have never had such hard working Realtors help sell our home”. “We would like to express our gratitude to Mayra & Ben Stern for all the support and help given to us to successfully complete the sale of our former home in Parkland Isles“. “…I would like to say that having you as the listing realtors for the sale of our home in Parkland Isles made the process enjoyable. You always kept your word about anything that you said to us. You did such a great job of advertising our home that it was sold only four days from the time that we signed a contract with you. We were also able to negotiate a sale price that worked for us, especially in light of the fact that the price we received was the highest to date for our particular model. During the sale process you answered any question posed by us. You always returned our calls in a timely fashion. We had a great experience with two professionals from the time of listing until the time of closing. We could not have gotten any better service. 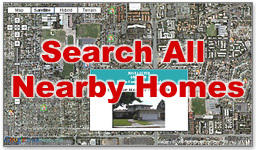 We wholeheartedly recommend you two to list any of our former neighbor’s homes in Parkland Isles”. “Thanks again for a wonderful job! I would recommend you HIGHLY to anyone that was thinking of putting their house on the market! You were very professional and were always available to answer any of our questions”. “ Dear Ben and Mayra: Thank you for being so helpful in the purchase of a beautiful house. You guys kept in touch with us every step of the way. We felt very well oriented and confident through the whole process…We would definitely use your services if needed either in sale or purchase”. “Both Yasemin and I also want to Thank You. Not only was it a pleasure doing business with you, it was also our pleasure seeing you in a most professional manner. Well done from both of us and we hope that our paths will once again cross for all the best reasons. We like doing business with good people and creating a friendly and positive relationship, as I feel we have done here. Good job and thanks for being there when we needed you the most. Do stay in touch. 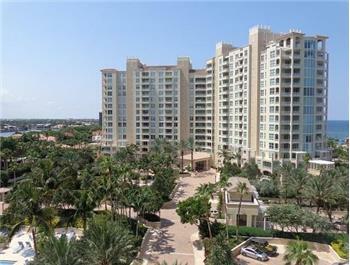 Another Toscana South Condo Sold, and Another Great Customer Review for Ben & Mayra Stern with Stern Realty! Escape the cold during the winter months! Buy a second home in Highland Beach, Florida! 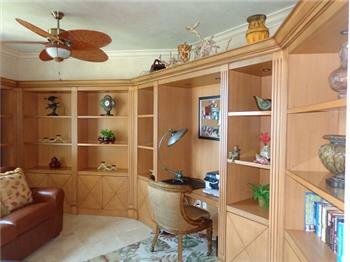 – 2 bedrooms + office, 2.5 baths, 2,552 sq. ft. of living area, and 2 huge balconies! 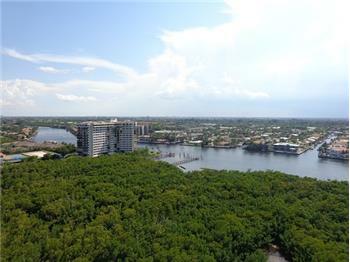 Magnificent views of the Intracoastal, ocean, and the Toscana Grounds from every window of this spectacular condo! Shows like a model with about $100,000 in recent upgrades! 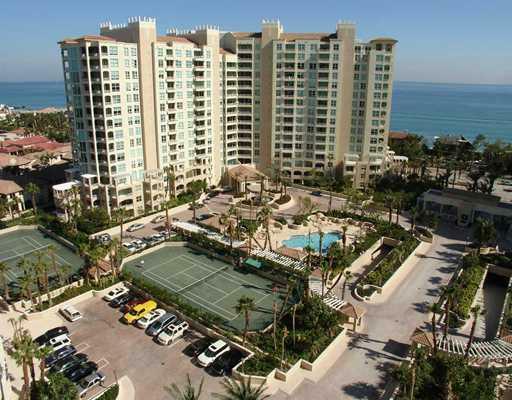 Luxury full service community by the beach! Pets of all sizes welcome! Thinking of Selling? Watch Our Listing Presentation! For years we had people tell us that Zillow estimates, made their home be worth this or that. The problem with the estimates that Zillow gives, is that they do not take into consideration many things that a Realtor would know to take into consideration when giving an estimate of value. Is the home a foreclosure? What is the condition of the home? What are the upgrades of the property? Does the home back to a main road? Does the home have a huge lot? Is that floor plan typically more desirable than another in the same community? What kind of views does the property have? Does it have a lake or a garden view? By the beach area, a condo on the 15th floor will not sell or rent for the same price as one on the 2nd floor. 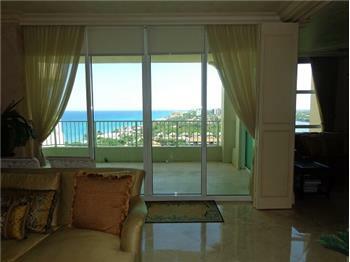 Does the property have an ocean view or an Intracoastal view, or both? They are stacks of a building that have better views than others. Is the property rental price for an annual rental or a seasonal rental? The same property can rent annually for just $6,000 per month, but when it comes to a short term rental during season, the same property can go for $12,000 per month. So, next time you want an accurate estimate of value, please, contact us! We will tell you what your home is worth based on accurate data and your property specific characteristics. We know that it is easier to get a listing when you tell the seller what he/she wants to hear. Many agents tell prospective sellers a sales price that is not that realistic so that the property owner is more willing to list with them than with another real estate agent interviewing for the same listing. As nice as it sounds to hear that you can get a higher price for your home, not listening to the agents that are being more honest & giving you a more realistic selling price based on the price of actual sold properties, will probably not do you any good. Your property will sit for months on the market without selling, while you help other comparable properties sell. Buyers in this market are very knowledgeable and computer savvy. Many overpriced homes will never sell, they become expireds. It has been proven, that if you price your property right from the beginning, you will sell it faster, and in many cases, even for more money than you would have gotten if you overprice your home. A property that has been on the market for so long makes buyers think that there is something wrong with it, or they will think that the owner is just not realistic, so they will pass and not even bother. As a seller, you might know that you will be flexible & negotiable once you get an offer, but all those buyers and agents out there do not know that. So, do you want to list with an honest agent that told you the truth from the beginning, or the one that did not? If you want two honest, full time Realtors, with 20+ years of experience to represent you when selling your property in Palm Beach or Broward County, please, contact Ben & Mayra Stern with Stern Realty Co at 561-715-0314. 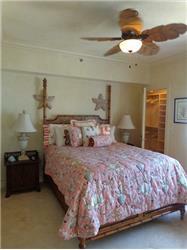 Short Term Furnished Rental by the Beach! Spectacular furnished condo available off season April 1 – November 30, 2016. $2,500 per month. 2BE, 2BA, and 1,400 sq. ft. of living area. Marble floors through out, upgraded kitchen with granite counter tops and tile backsplash, walk-in closets, beautiful furniture, and more! 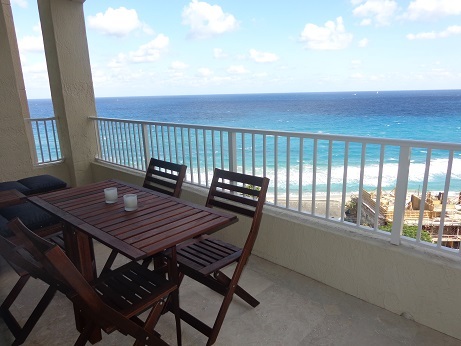 Enjoy the ocean breeze from your private patio! Highland Beach Club is a luxury community located in Highland Beach on the west side of A1A between the Intracoastal & the Atlantic Ocean. Amenities include: pool, hot tub, & BBQ area overlooking the Intracoastal, beach access, dock on the Intracoastal, 24-hour manned gate, tennis courts, clubhouse with social room, billiard’s room, business center, gym, sauna, & steam room. Highland Beach was voted 18th Best City to Live In by Forbes, and second safest city in Florida by ValuePenguin.com. Just minutes to DELRAY’S famed Atlantic Ave. & Downtown Boca Raton. For more information, please contact Ben & Mayra Stern with Stern Realty Co. at 561-715-0314. 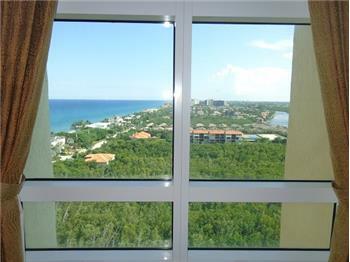 Short Term Furnished Rental in 5 star luxury condo in Highland Beach! Ben & Mayra Stern Sold More Condos in Toscana North Than Any Other Agent in 2015! We had a great year and we are very thankful that our Toscana clients gave us the opportunity to assist them in selling, or buying a condo here in Toscana. We could not have made it without them! Thanks so much for trusting us with the sale or purchase of your condo! We sold more condos in Toscana North than any other real estate agent or company in 2015! We sold almost 50% of all condos in Toscana North! We sold 20% of the condos in ALL of Toscana in 2015! We saved our Toscana owners almost $75,000 in commissions (compared to a 6% commission), and it took us an average of only 35 days to sell the condos (vs. the average days on the market of 121 days for all 25 condos sold in 2015). We sold our listings 4 times faster than the average. The average sold price vs. listing price for all 25 condos sold was 90%. Our average was 94% (As an average, our listings sell only 6% below listing price which means much more money in the sellers’ pockets). 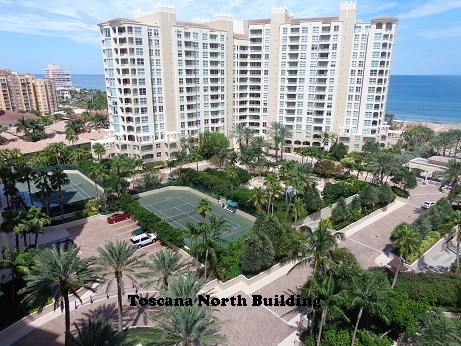 Toscana, also known as Toscana Towers, is a three building luxury community located on the west side of A1A between the Intracoastal & the Atlantic Ocean. 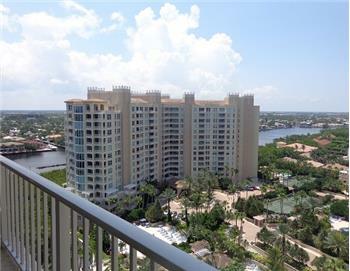 Toscana has spectacular Intracoastal, ocean and city views. Toscana North has 17 floors and 143 units, Toscana West has 16 floors and 118 units, and Toscana South has 18 floors and 159 units. There are 422 units in Toscana. Toscana is a 24-hour manned gated community with 2 tennis courts, bocce ball court, shuffleboard, and private beach with beach club. The Toscana Beach Club has a social room, lockers, kitchen, showers, BBQ area, and beach chairs with umbrellas. The Toscana attendant will provide you with towels and water! Each Toscana building has a heated pool and hot tub with attendant, cabana baths, fitness center, sauna, steam room, locker room, billiard’s room, social room, TV room, business center, kitchen, private coded elevator access to each apartment, underground parking, valet parking, 24-hour concierge service & staff, private air conditioned storage, bicycle storage, and on-site maintenance & management. 2, 3, 4 & 5 bedroom units. 2 Huge Balconies! Residents must have a parking space for each car they own or lease. They can purchase ($50,000+) or rent ($150-$250 per month) a parking space, if needed. Public schools are: J. C. Mitchell Elementary School, Boca Raton Community Middle School, and Boca Raton Community High School. A few pets (no size restriction) are allowed in Toscana, except for tenants renting a unit. Toscana has lots of social gatherings. The price range of condos for sale in Toscana is $550,000 – $5,500,000. The price range of units for rent in Toscana is $4,000 -$12,000 per month. Highland Beach was voted second safest city in Florida by ValuePenguin.com . Come to beautiful & exclusive Highland Beach, Florida to escape from the cold, the noise, and the crime! Call Ben & Mayra Stern with Stern Realty Co. at 561-715-0314 to see any properties in Highland Beach. Visit our Toscana Real Estate Website here! Thinking of selling your Toscana condo? Do not list with anyone else until you watch our Toscana Listing Presentation! View our Listing Presentation as a PDF Document Here! 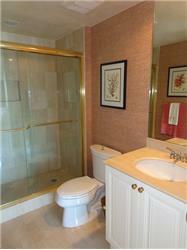 Remodeled Waterfront Townhouse in Boating Community Walking Distance to the Beach! 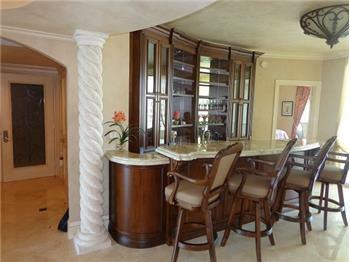 Remodeled waterfront townhome in the exclusive gated, boating community of Ocean Ridge Yacht Club. Corner unit on a cul-de-sac w/ 3BE+loft, 2.1 baths, and 1 car garage. Huge deck & balconies overlooking the beautiful canal & the marina. Just painted, new impact windows and doors. New impact resistant garage door. Just remodeled kitchen with GE profile appliances, granite counter tops, highest quality cabinets, Mexican tile floors, & more. New hardwood flooring, recently remodeled bathrooms, new water heater, new high efficiency W/D, rebuilt lower deck, & more. The roof was inspected recently and was found to be in superb condition. Just steps from the community pool & the boat docks. Listed at $800,000. 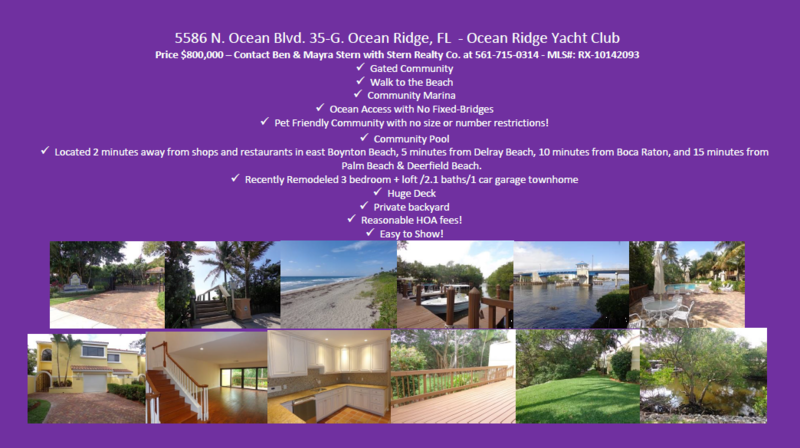 Ocean Ridge Yacht Club is one of the most exclusive boating communities in the town of Ocean Ridge. ORYC is a secluded small gated community with magnificent professionally landscaped grounds. As soon as you enter through the gate, you feel the peacefulness surrounding the most beautiful community: well kept wood deck pathways, huge open grass areas, mangroves, boat docks with picnic areas, and views of the Intracoastal and the water canals leading you into the Intracoastal Waterway. 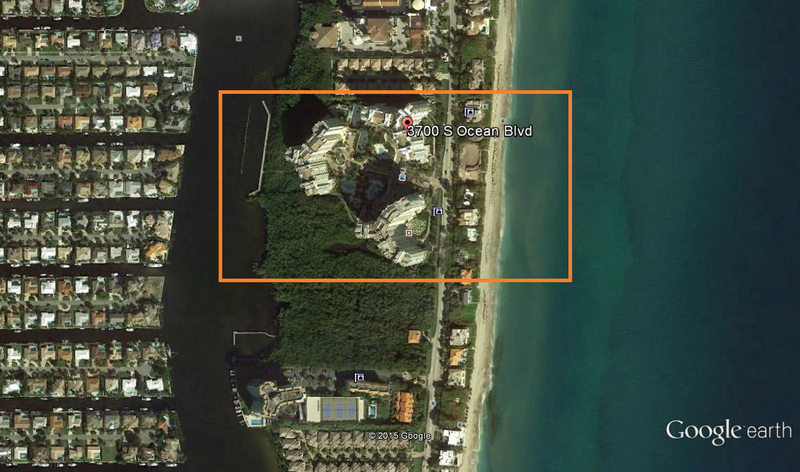 Ocean Ridge Yacht Club is located on 9.9 acres of waterfront property and originally had only 44 luxury townhomes. Award winning architects Schwab & Twitty designed the Mediterranean style, two story townhomes. Kamil Pharaony and Teymoor Siahpoosh were the developers of ORYC. Renowned designer Prof. Grenville Pollen was the designer. 18 years later, 6 more townhouses were built within ORYC. Features & amenities include: beach access, a custom designed community pool surrounded by a wide sun terrace, a cabana bath, showers, eating area, and a BBQ grill. Walking distance to the beach! The community boat docks accommodate boats of up to around 35 feet. 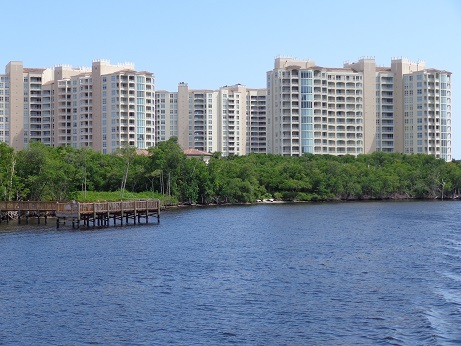 Take your boat out on the Intracoastal and get to know your town and the beautiful towns that surround Ocean Ridge. There are plenty of casual and upscale restaurants very close by that you can dock your boat at. 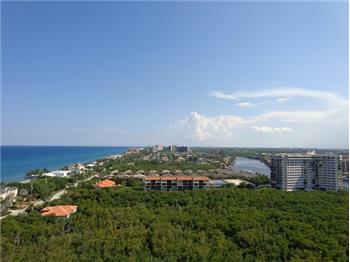 It will only take you 15 minutes to get to the Boynton Beach Inlet and the Atlantic Ocean from Ocean Ridge Yacht Club. This yachting community is close by to one of the best deep water fishing areas in Florida. Ocean Ridge Yacht Club is a pet friendly community located next to Boynton Beach, and just a few minutes away from the exclusive town of Manalapan, Palm Beach, Delray Beach, and Boca Raton. Mayra Ottati Stern was born in Caracas, Venezuela. She graduated from the Humboldt School in Caracas and attended several years of law school at the Andres Bello University in Venezuela. She received her real estate license in 1996. Mayra worked for Century 21 - Luxury Homes from 1997 to 2000 as partner to Benjamin Stern in the Corporate Division. She assisted corporations relocating employees with home purchases and sales, home rentals, temporary housing, general orientations, settling-in services, and look-see trips. Mayra Stern also helped many foreign buyers and sellers with their real estate needs. In 2000, she transferred to Realty Executives while still assisting corporations with all phases of relocation for their employees. Mayra speaks Spanish and English. Benjamin E. Stern was born in Brooklyn, New York. He graduated high school from the American International School, Belgium, where his parents live, and later received his Bachelor of Science from the University of California, San Diego. He received his real estate license in 1990. Ben worked for Better Homes and Gardens (GMAC) for a year. In 1991 he joined Luxury Homes Realty (later Century 21 - Luxury Homes) as manager of the new rental department. Benjamin Stern became the Corporate Housing Director for Century 21 in South Florida. He worked with Motorola's International Human Resource Department to provide temporary housing accommodations to Motorola employees, as well as assisting employees with look-see trips, settling-in services, home buying & selling. Benjamin Stern played an integral part in the relocation of MCI, ADT, Sensormatic, Office Depot, Nextel, Sun Microsystems, and several other companies. 1995 - 2000: recipient of Platinum Club Award for being one of the top ten producers of Century 21 - Luxury Homes. 1998: recipient of the #1 top producer in the company and Centurion Club (highest achievement award for Century 21). 1999: recipient of the #1 top producer in the company and Centurion Club. 2000: recipient of the #1 top producer in the company and #3 in the entire southeast region and Centurion Club. Inducted into the Realtor's Honor Society. VIP Realtor designation (relocation specialist). In 2000, Ben Stern transferred to Realty Executives to expand on all phases of his business. In 2004, Ben & Mayra opened their own real estate company, Stern Realty Co. Through the years, they worked with many customers buying, selling, and renting luxury properties in Broward County and Palm Beach County. They are currently living in Highland Beach, Florida. Ben & Mayra Stern specialize in luxury Highland Beach condos & homes, Boca Raton condos & homes, Delray Beach condos & homes, Gulf Stream condos & homes, Ocean Ridge condos & homes, Manalapan condos & homes, Deerfield Beach condos & homes, Hillsboro Beach condos & homes, Hillsboro Mile condos & homes, Parkland homes & townhouses, Coral Springs homes and townhomes, beachfront condos, beachfront homes, waterfront condos, waterfront homes, second homes, corporate relocation, international clients, and all luxury properties in Palm Beach & Broward Counties. Both Benjamin & Mayra Stern are members of the Realtors Association of the Palm Beaches, the Florida Board of Realtors and the National Board of Realtors. Since 1997, Ben & Mayra have spent much of their time helping the Tri County Animal Rescue by fostering dogs, helping at local events, and walking the dogs at the shelter. They are able to raise money for the shelter by helping the Paws for the Cause organization, and through social media promotions. Since 2013, Ben & Mayra are part of the A Second Chance Puppies & Kittens team. They foster dogs for this organization, help at events, advertise & raise funds for the organization through social media, and are Online Adoption Counselors. In 2014, Ben & Mayra also started helping All For One Pet Rescue. To date, they have fostered 18 dogs and counting! Languages: English - Español - Français - Nederlands. Better service, fast results, lower commissions, and NEVER a processing fee! If you are interested in buying, selling or renting a property, please contact Ben and Mayra Stern with Stern Realty Co. at 561-715-0314 or BenAndMayraStern@hotmail.com .